Heat 3 tablespoons vegetable oil in a large skillet over medium-high heat. Cook the onions in the oil, stirring often, until they begin to brown, 10 to 15 minutes. Onions should be a nice caramelized brown color. Add garlic and cook another minute. Remove from pan, drain on a paper towel-lined plate. 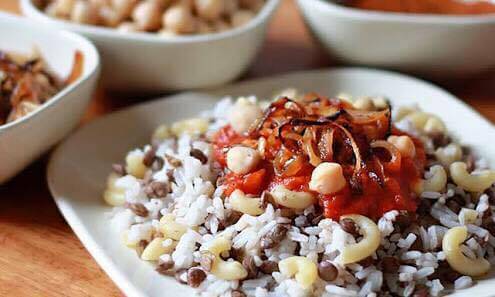 In a large pot over medium-high heat , put the oil of the fried onions and one tablespoon of the fried onion and add soaked black lentils and just cover it with water with one teaspoon salt and cumin and simmer until lentils are tender 15 or 20 minutes. After washing the rice , let it drain and then add it to the lentils in the same pot, add 2 tablespoons of vegetable oil , one teaspoon salt and cumin and stir rice and lentils well and add one cup of water (just to cover the rice and lentils ) , and simmer until the rice is tender and liquid has been absorbed, 20 to 25 minutes.